PocketDivXEncoder for Windows 10 - a tool for converting any video formats into a divx extension. The application allows you to set the parameters of resolution, aspect ratio and brightness of the content, uses mencoder, FFmpeg codecs for data processing and two-pass coding, supports interpolation and preservation of the original bitrate. Contains presets for creating videos for mobile device formats, provides a preview and the ability to process a list of files in sequential mode. 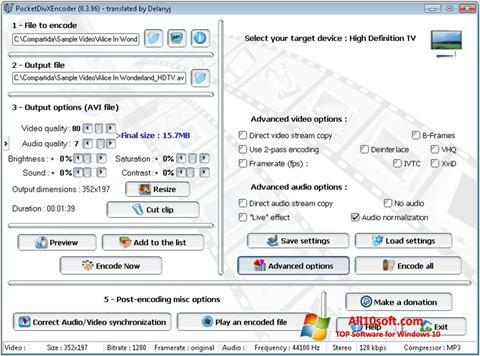 Able to correct the desynchronization of audio, video streams, normalize sound and frame rate. You can free download PocketDivXEncoder official latest version for Windows 10 in English.